If you're all about relaxed dressing when it comes to fashion, you'll love this extra cute pairing of a multi colored print bodycon dress and a MALI AND LILI mali lili quilted heart vegan leather crossbody bag. Sporting a pair of beige leather pumps is an easy way to add some flair to your ensemble. If you're a fan of practicality dressing when it comes to fashion, you'll love this stylish pairing of a light blue denim jacket and a MALI AND LILI mali lili quilted heart vegan leather crossbody bag from Nordstrom. We're all outfiting for comfort when it comes to dressing up, and this combination of a red floral cardigan and a MALI AND LILI mali lili quilted heart vegan leather crossbody bag is a practical illustration of that. You could perhaps get a little creative when it comes to footwear and spruce up your getup with red suede pumps. If you're all about relaxed dressing when it comes to fashion, you'll love this extra cute pairing of a light blue embroidered dress shirt and a MALI AND LILI mali lili quilted heart vegan leather crossbody bag. When it comes to footwear, this getup is finished off nicely with tan suede ballerina shoes. If you're a fan of practicality dressing when it comes to fashion, you'll love this totally stylish pairing of a white chiffon shift dress and a MALI AND LILI mali lili quilted heart vegan leather crossbody bag. A pair of white leather pumps will add more polish to your overall look. If you're all about practicality dressing when it comes to your personal style, you'll love this super cute pairing of a silver sweater dress and a MALI AND LILI mali lili quilted heart vegan leather crossbody bag from Nordstrom. You could perhaps get a little creative in the footwear department and spruce up your getup with navy embellished satin pumps. We're all outfiting for comfort when it comes to dressing up, and this combination of a tobacco coat and a MALI AND LILI mali lili quilted heart vegan leather crossbody bag is a great example of that. Wearing a pair of burgundy velvet pumps is a simple way to add extra flair to your getup. 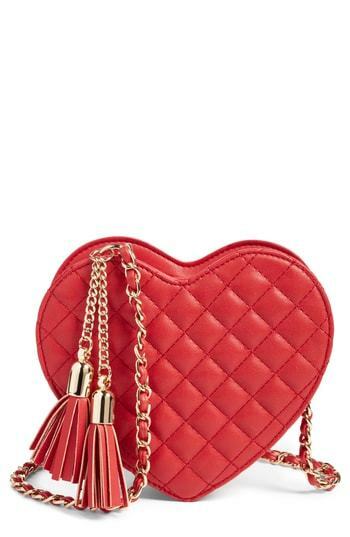 We're all seeking comfort when it comes to dressing up, and this combination of a red knit casual dress and a MALI AND LILI mali lili quilted heart vegan leather crossbody bag is an amazing example of that. Rock a pair of grey leather loafers to kick things up to the next level. Wear a blue denim shirt and a red quilted leather crossbody bag for an easy to wear look. Add a glam twist to your look with teal suede pumps.